Savoury muffins make a fun brunch or lunch served with a chunky tomato salsa and rocket salad — or just pack them, still warm, into the picnic basket. Heat the oven to 190C. Scatter the drained corn on an oven tray lined with baking paper and bake for 10 minutes. Remove and cool. Lightly oil six holes of a large muffin tin (and around the top, too) and line the sides of each mould with a slice of prosciutto. Mix the flour, paprika, cumin, sugar and sea salt in one bowl. Whisk the eggs, buttermilk and melted butter in a second bowl, then add the parsley and all but one tablespoon of the corn, mixing well.¦Add the egg and milk mixture to the flour mixture and combine very lightly with a fork until thick and clumpy — do not overmix. 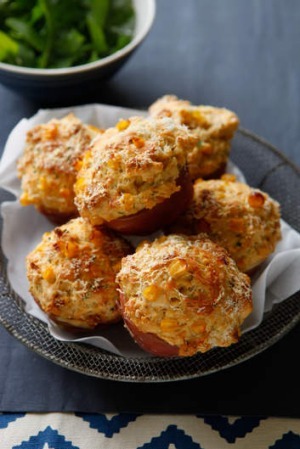 Divide the mixture between muffin holes, filling right to the top, and scatter with remaining corn kernels and grated cheese. Bake for 20 to 25 minutes or until an inserted skewer comes out clean. Serve warm (best eaten same day).